MESA – When her mother’s brittle diabetes got out of hand, Maria Klimaszewski knew the choice was clear: Bring her home. It was difficult to provide the kind of care, interaction and supervision needed by her 71-year-old mother, Evelyn Hopkins. When Klimaszewski went to work, Hopkins was at home with little to do. “My mother wasn’t happy,” Klimaszewski said. 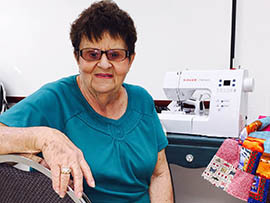 But after finishing work these days, Klimaszewski picks up her mother at the Oakwood Creative Care, finding out that Hopkins has taken a history class or sewn a quilt to be donated to a charity that helps children. Her mother’s joy is apparent. Oakwood Creative Care is a day club for those with Alzheimer’s, dementia and other degenerative diseases. Her staff leads members in fitness sessions like yoga, Zumba, and tai chi to improve balance and reduce falls. There also are outings such as fishing trips. On this day they were making sculptures using three-dimensional cardboard shapes, hot glue, paper mache and paint. “When they are done we will have a art gallery for their families to come and visit,” Friend said. The activities and interaction help participants maintain increase or maintain their cognitive function, Friend said. “They are increasing in their social skills and in their physical skills,” she said. The club costs $80 for a full day and $40 for a half day, but Friend said it’s covered by Medicare and insurance. Hopkins, Klimaszewski’s mother, said being here makes her feel like she is accomplishing something. Friend said while the day club strives to brighten the days of members but also has a big impact on their families. “They are able to realize that their loved one isn’t a disease, they still have life left,” she said. Klimaszewski said the biggest difference Oakwood has made in her life is seeing her mother’s happiness. “It keeps her mind occupied, it keeps her heart full and interactive so she’s not doing anything and it gives her joy,” she said. Hopkins said that it’s not just the sewing machine that keeps her coming back; it’s the staff and volunteers. 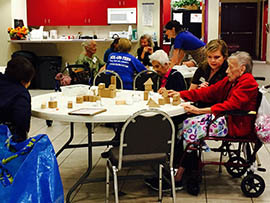 At Oakwood Creative Care day club members get the opportunity to create art using three-dimensional cardboard shapes, hot glue, paper mache and paint. Maria Klimaszewski said she is thankful for the experiences Oaklwood Creative Care gives her mother. “It keeps her mind occupied, it keeps her heart full and interactive so she’s not doing anything and it gives her joy,” she said.